I don’t know why JAL wants to charge $1,699 a seat to fly on this 2 am redeye from Haneda to Ho Chi Minh City on a Boeing 787, but the 2691.13 mile flight will only cost 12,500 Avios Miles. I’m still only halfway thru spending $20,000 on my Chase BA Card for 100,000 Avios Miles. 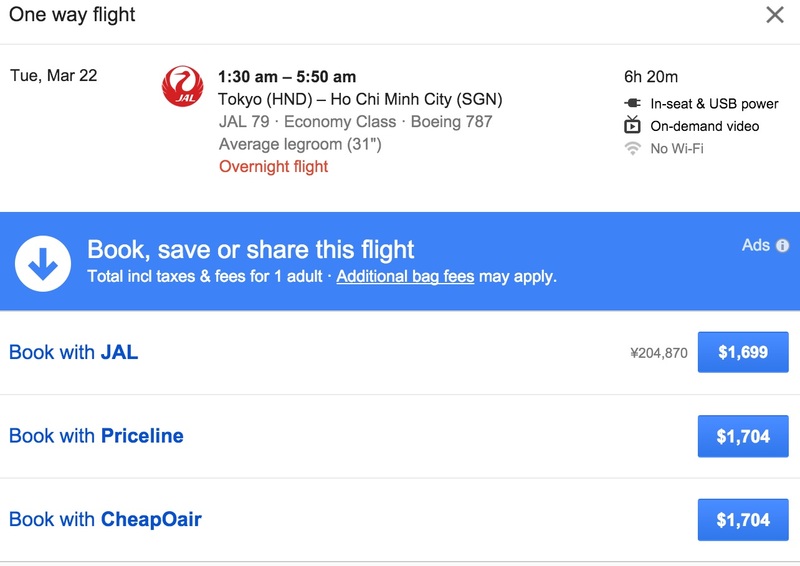 so at this redemption rate of 13.6 cents per mile, this deal is worth potentially $13,600 in travel on JAL. Thats not bad on $20k spend. So I decided to fly with a buddy to Tokyo using Experience Japan on ANA, then this flight, and then return on China Eastern to Oki making full use of lounge food and showers on our hotel free transit days. More to come on sleeping at airports and saving money by using the airport as a hostel and the lounges as mess halls. This entry was posted in Japan and tagged hostel, lounge, showers.